Shirt: Silver long-sleeve with a red stripe down each sleeve with a yellow stripe in the center. Pants: Silver with a red stripe down each leg with a yellow stripe in the center. 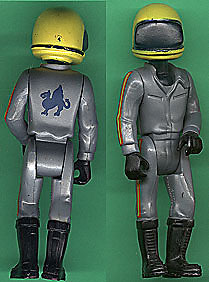 This figure has a dark blue dragon design heat-stamped on his back. The #369 set could have used this figure or the FPT1693 Driver.